The Kaladgi Basin is a well-known region of southern India as the area has been subject to archaeological surveys from the 1960s to the 1980s (Pappu & Deo 1994). Survey has resulted in the identification of 191 Middle Palaeolithic localities along the margins of the Malaprabha and Ghataprabha rivers. However, symptomatic of Palaeolithic research in South Asia, the Kaladgi Basin investigations lacked some basic requirements of modern palaeoanthropological investigations, including poor integration of interdisciplinary specialists, a lack of excavation of key localities, and deficient application of in-depth analytical studies, including technological analyses. In 1992, re-newed research was conducted in the Malaprabha Valley to more closely examine depositional contexts and identify localities away from the margins of the main river channel. Survey was concentrated around the modern village of Lakhmapur, resulting in the identification of a new, and previously un-reported, Palaeolithic landscape (Petraglia et al. 2003). Palaeolithic artefacts were distributed along the base of a quartzitic ridge and its hillslope, for a distance of 10 km. Artefacts were found on the surface and in buried deposits. Figure 1. Quartzite handaxe and cleaver made on flakes, Lakhmapur East. Figure 2. Benkaneri excavations in colluvium at base of quartzitic ridge and hillslope. Representing the first excavations in the Malaprabha Valley, two main localities near the modern-day village of Lakhmapur were tested (Petraglia et al. 2003). Stratigraphic and geoarchaeological research indicated the presence of distinct landscape segments and sedimentary environments connected with late Acheulean and early Middle Palaeolithic assemblages. 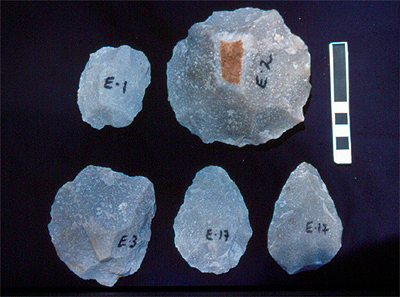 The early Middle Palaeolithic assemblages, as typified by the Lakhmapur East, were marked by prepared cores and diminutive bifaces (FIGURE 1). Lakhmapur represented an area of high resource utility, marked by springs and quartzite outcrops. Technological analyses indicated that Lakhmapur represented areas where stone artefacts were reduced after initial procurement at the quarry source. The goal of the 2000 field season was to excavate the nearby colluvium and quartzitic hills where it was presumed that the main quarrying effort was conducted. 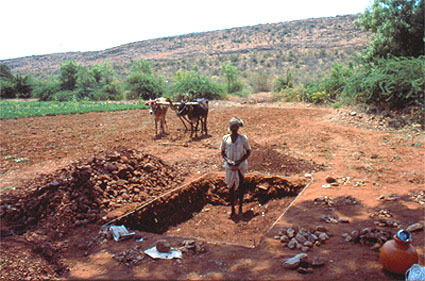 Test excavations were subsequently placed at Benkaneri (FIGURE 2). The excavations revealed high densities of cores, bifaces, and flake tools. The stone tools were technologically similar to the early Middle Palaeolithic industry recovered from Lakhmapur East, each assemblage consisting of a high number of prepared cores, as well as diminutive handaxes and cleavers. Like Lakhmapur East, Benkaneri tools were recovered from latosols. The Benkaneri excavations are significant as they represent the first excavation of a Middle Palaeolithic quarry in India, complementing the first excavation of an Acheulean locality in the Hunsgi Valley 150 km to the north (e.g., Petraglia et al. 1999). The Benkaneri excavations recovered bifacially flaked cores, radially prepared cores, unifacially retouched flakes, and small bifaces. The bifacial cores were discoidal, showing continuous flaking along their perimeters, and on both upper and lower faces. Flaked cores occasionally had large negative flake scars where large predicted flakes had been detached. The flakes were used to produce retouched tools, such as unifacial scrapers; however, formal flake tools were relatively rare at the quarry. The handaxes and cleavers were small, with the large majority manufactured on flake blanks. A series of experiments were conducted on variably sized quartzite cobbles obtained from the surface at Benkaneri (FIGURE 3). As no other raw materials were available, quartzite hammerstones were sought for direct percussion flaking. The experiments replicated the entire spectrum of archaeological types. This included prepared cores and bifaces made from the larger flakes (FIGURE 4) and prepared cores with struck flakes. Experiments indicated that there was some level of difficulty in producing long flakes from the hard quartzite material. In some cases the shape of the clasts prevented ease of prepared core manufacture. Additionally, the shape of some clasts, together with the hardness of the material resulted in the abandonment of some cores for additional flaking. Although the current research centres only on one valley, it is clear that many similar Middle Palaeolithic landscapes are preserved in India. Future research in South Asia has great, but largely untapped potential for elucidating hominin behaviours. Figure 3. 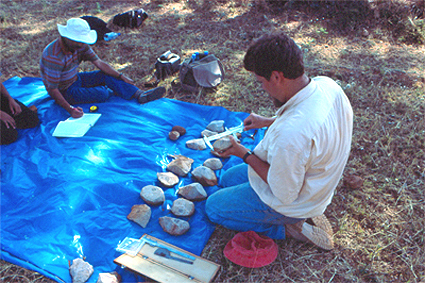 Stone tool experimental protocol, measuring quartizite cobbles for reduction. Figure 4. Experimentally-produced cores showing various stages (E-1 to E-3). 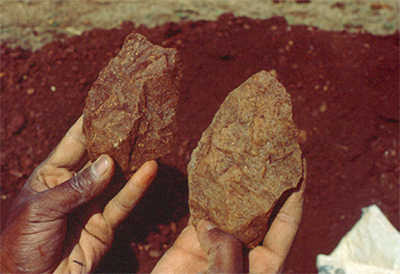 Two experimental handaxes made on large flakes (E-17). PAPPU, R.S., & S.G. DEO. 1994. Man-land relationships during Palaeolithic times in the Kaladgi Basin, Karnataka. Pune: Deccan College. PETRAGLIA, M., P. LAPORTA, & K. PADDAYYA. 1999. The first Acheulian quarry in India: stone tool manufacture, biface morphology and behaviors. Journal of Anthropological Research 55: 39-70. PETRAGLIA, M.D., J. SCHULDENREIN & R. KORISETTAR. 2003. Landscapes, activity, and the Acheulean to Middle Paleolithic transition in the Kaladgi Basin, India Eurasian Prehistory: in press. Schuldenrein, Geoarchaeology Research Associates, Riverdale, New York 10471, USA.